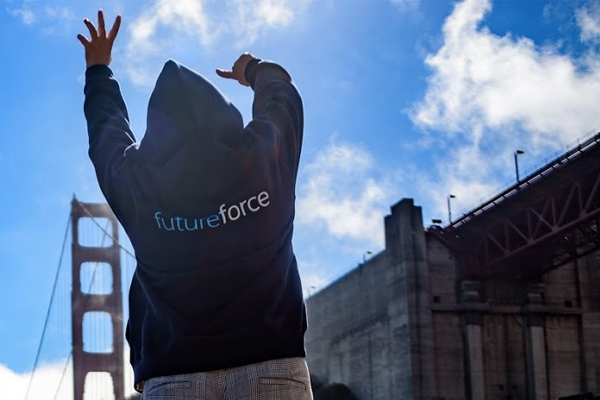 Last November, 100+ new Futureforce Success Graduates embarked on a trip to San Francisco for their new hire bootcamp. Learning the job, team-building events, sessions with the Senior Leadership team, cultural talks and soft skills workshops were at the heart of this amazing week. As a new Solution Engineer, arrived with the rest of my worldwide graduate colleagues, I was aiming to make the most of this experience and return home with many great takeaways. I first thought that these takeaways were about technical or soft skills, or some specific pieces of information. I later discovered that it was way more than that and I became convinced that embracing a company culture is one of the best journeys you can make as a new hire. According to a Gallup Report, 63% of millennials look for jobs at “learning organisations” where they have broad access to trainings. Moreover, meaning and purpose are the top elements searched for in new jobs. As a millennial, I can completely relate to those figures and was excited to start experimenting with that on a daily basis. Now, how did we shift from a job description to understanding many aspects of the business, our role, and most importantly feeling part of one of the most admired companies in the world? Well, it's a process. And every step along the way was sometimes unexpected but absolutely necessary to achieve it. While getting off the plane with my colleagues and driving to San Francisco city centre — first thing we saw on top of the skyline: the mythic Salesforce Tower. We obviously read and heard about it, but seeing it popping from first sights of the city really helped us understand that Salesforce is not only the largest employer in the city, but also a key part of its architecture and history. Salesforce has a huge impact on San Francisco through employment, architecture and much more, while trying to help champion some of the cities biggest problems too, such as homelessness. While walking through the streets of San Francisco, we could see with our own eyes that the homelessness crisis was far more real than we could have imagined. This experience helped us understanding how, and why, Salesforce was taking this very seriously by playing a key role into solving the problem. As working in a company that has a greater purpose was important to me, my feeling shifted from hearing news about it to fully experiencing it. After seeing the impact that Salesforce has in San Francisco, I just couldn't wait to see what was inside — and that was when the company culture became real for us all. I really felt impressed by how every value was represented, from Ohana floors opened to charities, to green hallways giving us the sense of sustainability. Those first two days of bootcamp really impressed me by the impact that Salesforce has on San Francisco, and the great causes of the world. Now, it was time to understand what our role was in that, as new hires in the Success Graduate program. Over the next few days we got the chance to have our Senior Leadership Team come in to talk to us about their roles, company-wide topics and driving some Q&A sessions. As Success Graduates, it was time to understand what we were there for and what impact we can drive for the success of our customers going forward. Hearing it come from the leadership team helped us instantly understand that the vision written on top of our job description was actually taking shape. That understanding was possible thanks to their transparency and the opportunity to ask open questions. We instantly took part in futurist talks with Peter Schwartz, SVP of Strategic Planning or more operational ones with Stephanie Buschemi, EVP & Chief Marketing Officer. The impact was clear: the leadership team is counting on us to play a role in Salesforce's missions and initiatives by giving us all the power to achieve them through growth and innovation. We walked out from these talks feeling empowered and knowing that we have the ability to play a role in this mission — with one remaining question: how are we going to achieve it? It was time now to be divided into our respective roles, I started to be gathered with other Solution Engineers and working into building the hard and soft skills I'll need to do my job. Visual: Using images to explain concepts and ideas is the best way to reach a visual learner. Auditory: They benefit from lectures, group discussion, and other strategies that involve talking things through. Reading/Writing: They love to read and perform well on written assignments such as stories or book reports. The bootcamp was built in a way to contain all those types of methods which allowed us to learn at our best. Learning, as a core value of Salesforce, was real and playing with various methods made it effective for all of us. On top of all that, I wasn't alone in that cultural journey and feeling close to my colleagues was another important aspect that I was able to experience. During that week, I got the chance to meet other graduates from all over Europe (Paris, Munich, Amsterdam, London, Dublin) and from other regions - Asia (Sydney, Singapore, Bangalore). I felt very international by having engaging discussions about different cultures, while at the same time I felt close to them as we are all part of the same company. Being on that journey together made me understand that the value of diversity at Salesforce was all around us, and that being part of that community gives us a chance to learn even more, together. The experience was coming to an end as we were starting to fly back to our different locations. However, while packing I felt that I was taking back home so much more than I thought I would. Back from San Francisco with great memories, we still make every effort to visit each other in different hubs to cultivate that sense of community, even after that bootcamp momentum. That was the sign for me that this cultural journey was far from being over. Step 5 - diffusing culture, everyday. 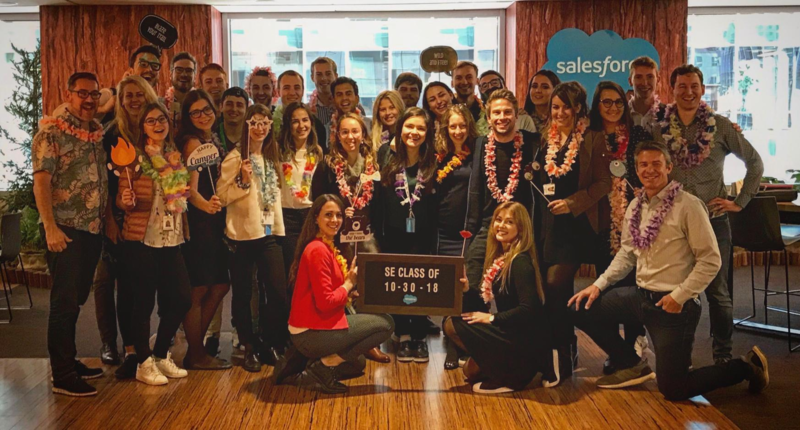 Coming back from bootcamp, we learned the greater context of Salesforce, the impact we can have with our role, how to use the skills we learned and apply them together. Now, it might be easy to forget about all that and plunge into our day-to-day work, but hopefully things are going on differently. By having this cultural journey, I started to feel that I was less of a new hire anymore and that I understood many more aspects of the business, the role and the impact that we, Success Graduates, drive everyday. It's time for us to start helping our customers succeed in this 4th industrial revolution, through discovery workshops and Salesforce demonstrations. The big difference is that — thanks to this cultural journey — it will be now with a purpose.